Yam CK-2A CNC Turning Center s/n E90100 w/ Fanuc Series 0-T Controls, 12-Station Turret, Hydraulic Tailstock, 8” 3-Jaw Chuck, Chip Conveyor. Yam CK-5 CNC Turning Center w/ Fanuc System 6TB Controls, 8-Station Turret, Hydraulic Tailstock, 12” 3-Jaw Chuck, Chip Conveyor. Mori Seiki MV Junior CNC Vertical Machining Center s/n 703 w/ Fanuc System 10M Controls, 16-Station ATC, 40-Taper Spindle, 16” x 35 ½” Table. Kafo KFV-40 CNC Vertical Machining Center w/ Fanuc 0-M Controls, 24-Station ATC, 40-Taper Spindle, 21” x 51” Table. Excell 810 CNC Vertical Machining Center w/ Fanuc 0M Controls,24-Station ATC, BT-40 Taper Spindle. Okada VM490 CNC Vertical Machining Center w/ Fanuc 0M Controls, 20-Station ATC, BT-40 Taper Spindle, 16” x 28” Table. Acra MC-1050P CNC Vertical Machining Center w/ Mitsubishi Controls, 24-Station ATC, BT-40 Taper Spindle, 25 ½” x 50” Table. Mori Seiki “Partner” M-300A1 2-Pallet 4-Axis CNC Vertical Machining Center s/n 119 w/ Fanuc 10M Controls, 20-Station ATC, BT-40 Taper Spindle, 12 ½” x 12 ½” Pallets, Chip Conveyor. Mazak VQC-20/50B CNC Vertical Machining Center s/n 59899 w/ Mazatrol CAM M-2 Controls, Tool Measuring System, ATC, 50-Taper Spindle, 21 ½” x 48 ½” Table. 1998 Haas VF-0E 4-Axis CNC Vertical Machining Center s/n 16874 w/ Haas Controls, 20-Station ATC, BT-40 Taper Spindle, 20Hp Vector Dual Drive, Brushless Servos, 10,000 RPM, Thru Spindle Coolant, Quick Code, Delta/WYE. Burgmaster VTC-150 “CNC Jobber” CNC Vertical Machining Center s/n 214022 w/ Burgmaster Controls, 20-Station ATC, CAT-40 Taper Spindle, 16” x 32” Table. Kitano “Variant Turn” CNC Turning Center s/n 10024 w/ Fanuc System 6T Controls, 12-Station Turret, 10” 3-Jaw Chuck. Nakamura Tome TMC4 CNC Turning Center w/ Fanuc System 6T Controls, 12-Station Turret, 12” 3-Jaw Chuck. Nakamura Tome SC-250 CNC Turning Center s/n S200308 w/ Fanuc Series 21i-T Controls, 12-Station Turret, Hydraulic Tailstock, 8” 2-Jaw Power Chuck. 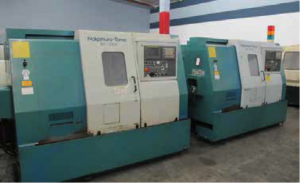 Nakamura Tome SC-250 CNC Turning Center s/n S200307 w/ Fanuc Series 21i-T Controls, 12-Station Turret, Hydraulic Tailstock, 8” 2-Jaw Power Chuck. Ikegai “Genesis 1210R” CNC Turning Center s/n 54346V w/ Fanuc Series 21i-T Controls, 12-Station Turret, Hydraulic Tailstock, 10” 3-Jaw Chuck, Chip Conveyor. Bridgeport Series 1 3-Axic CNC Vertical Mill w/ Bridgeport Controls, Kwik-Switch Taper Spindle, 60-4200 Controlled RPM, 12 ½” x34” Table. Lagun FTV-2S3- Axis CNC Vertical Mill s/n 21113 w/ Anilam 3000M Controls, Dial Change RPM, Kwik-Switch Spindle, 10” x 50” Table. Davenport mdl. B 5-Spindle Automatic Screw Machine s/n 5730 w/ Drill Stations, 5-Cross Slides, Threading Attachment, Pickup Attachment, Double Acting Chip Conveyor, Bar Feed. Davenport mdl. B 5-Spindle Automatic Screw Machine s/n 5482 w/ Drill Stations, 5-Cross Slides,Threading Attachment, Pickup Attachment, Pneumatic 5C Closer, Single Acting Chip Conveyor, Bar Feed. Davenport mdl. B 5-Spindle Automatic Screw Machine s/n 5586 w/ Drill Stations, 5-Cross Slides, Spindle Stop Clutches Installed, Threading Attachment, Pneumatic 5C Closer, Single Acting Chip Conveyor, BarFeed. Pickup Attachment, Pneumatic 5C Closer, Single Acting Chip Conveyor, Bar Feed. Davenport mdl. B 5-Spindle Automatic Screw Machine s/n 7149 w/ Drill Stations, 5-Cross Slides, Spindle Stop Clutches Installed, Threading Attachment, Pickup Attachment, Pneumatic 5C Closer, Single Acting hip Conveyor, Bar Feed. Davenport mdl. B 5-Spindle Automatic Screw Machine s/n 8875 w/ Drill Stations, 5-Cross Slides, Pickup Attachment, Pneumatic 5C Closer, Single Acting Chip Conveyor, Bar Feed. Davenport mdl. B 5-Spindle Automatic Screw Machine s/n 2246 w/ Drill Stations, 5-Cross Slides,Threading Attachment, Pickup Attachment, Pneumatic 5C Closer, Single Acting Chip Conveyor, Bar Feed. 2007 Rofin Sinar Powerline EII Air-YAG Self Contained CNC Laser Marking System s/n 40123378 w/ 14 ½”x 21” Table (NO COMPUTER – BUT HAS DISCS). Baasel Lasertech NKE-Flexible mdl. SMD-40 Laser Engraving System s/n A.36 w/ YAG-Laser. 2004 Pryor CNC Laser Engraving System s/n VI03E0904. Promecam 80 Ton x 8’ CNC Press Brake s/n 32-8025- 1033 w/ Hurco Autobend IV Controls, 98 ½” Bend Length, 16” Throat, 85” Between Uprights, Light Curtain. 1993 Haco PPES135-12BC25GR 135 Ton x 12’ CNC Hydraulic Press Brake s/n 80275 w/ Haco BC25 Controls, 10” Throat Light Curtain. Aida PC-12(2) 150 Ton Stamping Press s/n 001115-0284 w/ 24.8” x 48.8” Bolster Area, 19.7” x 25.4” Ram Area, 7.8” Stroke, 45 Strokes/Min, 3.3” Ram Adj., 15.7” Shut Height. R.H. Strasbaugh mdl. 6BA-4 4-Head Lapping Machine s/n 21-7- 74 w/ Pneumatic Down Pressure. Hyprez mdl. 42SLM230VP 42” Lapping Machine w/ Digital Controls, 3-Stations, Pneumatic Down Pressure. Carlan Engineering 32” Lapping Machine w/ Inner and Outer Torque Speeds, Timers. Boyar Schultz 6” x 12” Surface Grinders. Bazell Technologies CF-65G2 Micro Separator s/n 654094. 2005 OCE mdl. Arizona T220 4+2 Color Gantry Style Solvent Printer w/ 62 ½” x 120 ½” Max Print Size, 309 DPI, 68 ½” x 168” Vacuum Table. (11) Lincat mdl. LPW 750 Watt Glass Front Lab Ovens. Markem mdl. 527 Marking Machine. Cincinnati Bickford 8” Column x 24” Radial Arm Drill s/n 1R2853 w/ Power Column and Feeds, 20” x 24”Compound Fixture Table. Walker Turner 6-Head Gang Drill Press. (2) Clausing 3-Head Gang Drill Presses. Johnson 8” Horizontal Band Saw. Despatch RS-3HD 650 Degree 26kW Electric Heat Oven s/n 74826. Kelco mdl. GH36C Dry Blast Cabinet. Mitts &amp; Merrill mdl. DM7120 10X12 3-Blade Plastics Granulator. 2005 Optimum OPTI-D240X500G Bench Model Lathe w/ 125-2000 RPM, Tailstock. Hwacheon HL435X1000G mdl. HL435 17” x 40” Geared Head Gap Bed Lathe s/n 22-1080 w/ Turnvision Programmable DRO, 32-1800 RPM, Inch Threading, Tailstock, 8” 3-Jaw Chuck, Coolant. RPM, Inch/mm Threading, Tailstock, 12” 30Jaw Chuck, Coolant, Shaoxing Type 110-2075 12” x 36” Geared Head Gap Bed Lathe w/ Tailstock, Steady Rest, 6” 3-Jaw Chuck, 8” 4-Jaw Chuck. (2) Logan mdl. 7515-L Hand Chuckers w/ 8-Station Turret, 5C Collet Closer, Power Feeds. Denham S.R.14 30” x 128” Open Gap Lathe s/n 10199 w/ 54” @ Gap, 4 5/8” Thru Bore, 10-400 RPM, Inch Threading, Tailstock, Steady Rest, 30” 4-Jaw Chuck. Ponar 25” x 90” Lathe s/n 39203 w/ 18-1800 RPM, Taper Attachment, Inch/mm Threading, Tailstock, KDK Tool Post, 12” 3-Jaw Chuck, 16” 4-Jaw Chuck. Hardinge ESM Second OP Lathe w/ 5C Collet Closer. Weiler 12” x 36” Gap Bed Lathe w/ Inch/mm Threading, Tailstock, 8” 3-Jaw Chuck, Coolant. American Pacemaker “32” Raised” 46” x 92” Geared Head Lathe s/n 72206-51- 28-2- 3-007 w/ 6-600 RPM, Tailstock, KDK Tool Post, 41” Face Plate. Bullard “Man-Au- Trol” 54” Vertical Turret Lathe w/ Anilam Wizard DRO, 2-Heads, Hydraulic Facing Head Attachment, 54” Chuck. Bullard 42” Vertical Turret Lathe s/n 21248 w/ 5-Station Turret, Facing / Turning Head, Threading, 42” Chuck. Vertical Spindles, Universal Vertical Milling Head, Box Ways, 15 ¾” x 78 ¾” Table. Bridgeport Series 1 – 2Hp Vertical Mill s/n 18941 w/ 60-4200 Dial RPM, Chrome Ways, Power Feed, 9” x 42” Table. Beaver VBRP Vertical Mill s/n 3829/2 w/ 40-Taper Spindle, Box Ways, 8” Riser, 10” x 50” Table. R8 Spindle, Power Feed, 9” x 42” Table. Bridgeport Vertical Mill s/n 108179 w/ Anilam Miniwizard DRO, 60-4200 Dial RPM, Power Feed, 4” Riser, 9” x 42” Table. Saimp Type FVO Vertical Mills/n0645 w/ 110-2720 RPM, 30-Taper Spindle, Power Feed, 7” Riser, 10” x 44” Table. Bridgeport Vertical Mill s/n 155643 (NO MOTOR) w/ 60-4200 Dial RPM, Power Feed, 9” x 42” Table. Bridgeport Series 1 – 2Hp CNC Vertical Mill s/n 197440 w/ Bandit Controls, 30-Taper Spindle, Power Drawbar, Chrome Ways, 9” x 42” Table. Miyano ATS-60S Twin Spindle CNC Turning Center s/n ATS0037SA w/ Fanuc 0T Controls, 12-Station ATC, Front and Rear Rigid Tool Holders, 15-3000 Main Spindle RPM, 45-4500 Sub Spindle RPM, 100-3000 Revolving Tooling RPM, 10” 3-Jaw Power Chuck – Main Spindle, S26 Collet Pad Nose – Main Spindle, S20 Collet Pad Nose – Sub Spindle, Simultaneous 2-Axis Interpolation, “C” Axis @ 0.001 Deg., 25 ½” Max Swing Over Bed, 28.25 Max Turning Length, Parts Catcher and Conveyor, Chip Conveyor, Coolant Matsuura MC-1000VS2 4-Avis CNC Vertical Machining Center s/n 84043805 w/ Yasnac M5X Controls, 20-Station ATC, BT-40 Taper Spindle, 5000 RPM, 4 th Axis 12” Rotary Head with 8” 3-Jaw Chuck, 19 ½” x 47” Table, Coolant. Mori Seiki MV-35/40 CNC Vertical Machining Center s/n 327 w/ Fanuc Controls, 20-Station ATC, 40-Taper Spindle, 14” x 43” Table, Chip Conveyor. Mori Seiki MV Junior CNC Vertical Machining Center s/n 1110 w/ Fanuc Controls, 20-Station ATC, 40-Taper Spindle, 16” x 35 ½”Table. Mori Seiki SL-3A CNC Turning Center s/n 319 w/ Yasnac Controls, 8-Station Turret, Hydraulic Tailstock, 8”3-Jaw Chuck. Femco WNCL-10/25 CNC Turning Center s/n 2001 w/ Fanuc System 10T Controls, 12-Station Turret, 5C Collet Nose, Chip Conveyor. Stryco, Seedorf and Banker 50kVA Spot Welders (NO ARMS). Lincoln Idealarc TIG-300/300 Variable Voltage AC/DC Arc Welding Power Source. Airco CV-250 Arc Welding Power Source w/ Miller S-22A Wire Feeder. Acorn 48” x 48” Forming Table. Lincoln Idealarc TIG-300/300 AC/DC Arc Welding Power Source w/ Cooler. Lincoln SA-200/F- 163 Gas Powered Arc Welder.